I live in Wisconsin, how would this perform in the winter hunts here. cold weather? Depending how cold you can vary in FPS due to orings getting hard. I would like to paint the front site white. Do have any suggestion on paint? 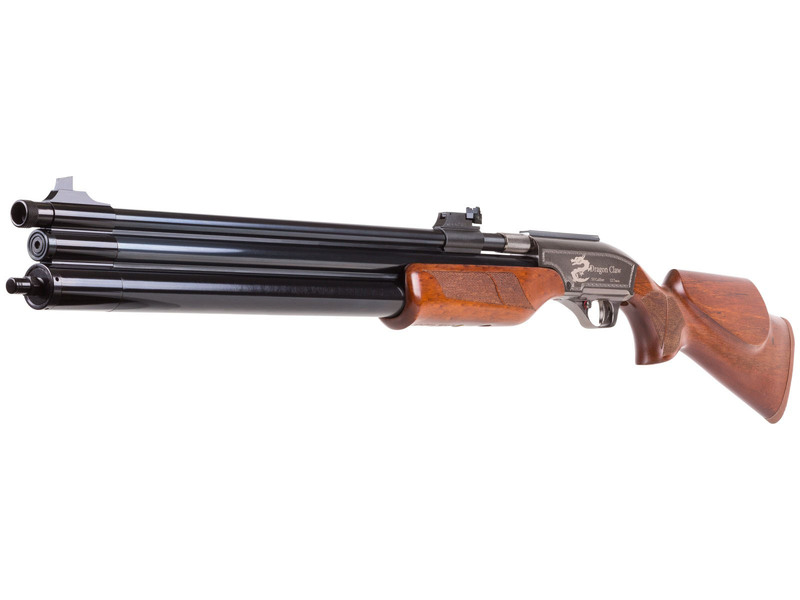 This is a beautiful air rifle! However which would you choose? The Seneca which can only deliver only 230 +/- ft/lbs at the muzzle, depending on the weight of the projectile, or the Umarex Hammer that can deliver up to 700 ft/lbs at the muzzle, depending on the projectile's weight? Well considering the Hammer hasn't actually been released yet, that really can't be answered. Air leaking out of the fill up port. I bought the Mantis 4-12x40 AO Rifle Scope to put on my dragon claw and the the scope hits the iron sight. How do I get the scope up higher to clear the sight or around the sight? Or how do you remove the sight? Any suggestions will be most grateful...thanks. can they be shipped to belgium ? With the refurbished "version". what is done to the gun and by whom? They are inspected/fixed by the Tech Team at Pyramyd Air. If service is required, that is done. The gun may have come back for various reasons, so it is impossible to cover ever scenario, but if the gun had an issue and required new parts, those parts are replaced. Which Degassing Tool works for the Dragon Claw? If you plan to cast your own ammo, I would definitely think slugging the barrels will be a smart move. That way you know exactly what diameter ammo you need to cast. Would a Benjamin hand pump work on this? There is no choke on the dragon claw, only the wing shot. On the wing shot, you do need to remove the choke. can u shoot shot shells out of this gun? I am looking for aftermarket barrels to make improvements of my own design. Any suggestions or ideas where to look? Which suppressor model works on this rifle? (Please, no warnings about buying suppressors... I know the laws... just tell me which models will work on this gun) Thank you! Pyramyd does not offer one. Roughly how many pumps should it take to fill the 500cc with a hand pump, and how long ? What is the size of the thread at the end of the muzzle? Is this legal for bow season in Ohio? Do you need your license even though it's an air rifle? What type of fill port is used on this version? Older models use 1/8 BSPP. Can the new style be bought as a replacement? The current version uses a male quick disconnect fitting. Can use nitrogen in stead of air. Will this Sam Yang Dragon Claw work with #6 & #8 shot shotgun amio???? It will shoot arrows and as well as of up to .600" in the 500cc .50cal model!!! Got mine and shot it today using the Air Bolts. I had to really jack up the rear sight for 30yd shots. I can't imagine a scope having that kind of adjustment... we'll see... but I was wondering how close POA/impact is between arrows and slugs? I'm wondering if it can be that far off between the two? If I'll need to crank the sight back down to a more normal position when I shoot slugs? Anybody shooting both? How hard is it to fill with air pump? What mold cast the most accurate usable bullet for hunting dear sized animals. not recommended, this barrel is rifled bore not smooth bore, you will get plastic fouling but you can use sabots with .45 cal bullets but you will get the same plastic fouling. On the eunjin meter what is the Max fill 20 or 30? How much does this gun weigh? What is max affective range of this gun? Do they have a left handed stock or version of this rifle? I got the .50 cal 250 grain from venturi and it seems to be a super tight fit and I'm afraid it will get stuck in the barrel? I believe that you should "slug" your bore and, using accurate calipers, measure the slug. Then, go to a seller, like Hunter's Supply, and have them swage bullets to your exact caliber. They will usually do this for you at no extra charge, and you can then be sure that the ammunition you are using will perform well in your gun. Does this gun have a swivel stud ( if not how can I put a bipod on it )? The ammo on this site is limited, can these big bore rifles shoot standard muzzle loader rounds, specifically sabot rounds from Hornady or Thompson/Center? This gun should use only soft lead bullets for best performance. Hard lead, jacketed, sabots, and lubricated bullets should be avoided. They can damage rifling, sabots can come loose and plug a barrel, and lubed bullets can dirty a barrel quickly. this gun is loud is there a suppresser that fits this gun ??????????? There are supressors that will fit, but in most states, they require a special license, or are simply illegal to use on ANY type of gun, firearm or air. Don't take the chance! How many full power shot on one fill? I get 15 shots using 185 gr lead. After 15 shots on full power I see bullet drop out of the x zone by about 1/4" lower by shot. Read the part of the description that describes the technique of switching to half-power after 4th shot and basically continue getting consistent shot string. You will get roughly 6 shots per fill. THis is in the "hunting" category so what kind of game does that include? In some locales, they can be used to hunt deer sized animals. Laws vary, so do your homework before you decide to use this on game animals. this one when untuned can take up to javelina up to 35-40 yards. People do hunt wild boar with these. Is there a way to put a bipod on this dual tank gun. If so, what kind do I need to get? You would have to tap the fore grip with a swivel screw, then get a bi pod with the swivel adapter. I would seat the pellet further forward in the breech. How do you fill the middle air resevior? The middle reservoir is connected to the bottom one, so when you fill the rifle you fill both tanks at the same time.